Click on icon to find out more! Open solution, not tied to any brands, existing devices can be integrated into the system. Scalable solution expands according to the needs of a specific room and it’s functions. Allows using devices from different areas in one and the same, seam-less system. Transformable user interface allows solution to adapt also into the needs of recovery rooms as a monitoring system and Pathologies as a material management and documentation tool. Less mistakes from one point of management and less unnecessary movement during procedures. Increased data security with backup feature for unexpected network failure. Decreased risk of set-up errors for sterile/non-sterile areas. Traceability of all phases of any procedure increases patient security. Patient data tagged images and videos are ready for replay any time. User rights and user groups are defined by hospital’s own data security policy. High efficiency of device management from one point of use. Pre-set user specified defaults on devices e.g. surgeon related light combinations and table setups. Maintain identical user interfaces between different OR-s, less device specific trainings needed. Can be installed inside current facilities. Efficiency is increased with a Preset and Shut Down feature allowing quick and easy transition of all devices into sleep mode for cleaning and faster turn-around time. 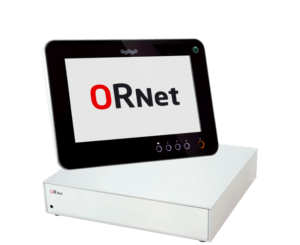 Subscribe to our newsletter to get latest updates of ORNet products!